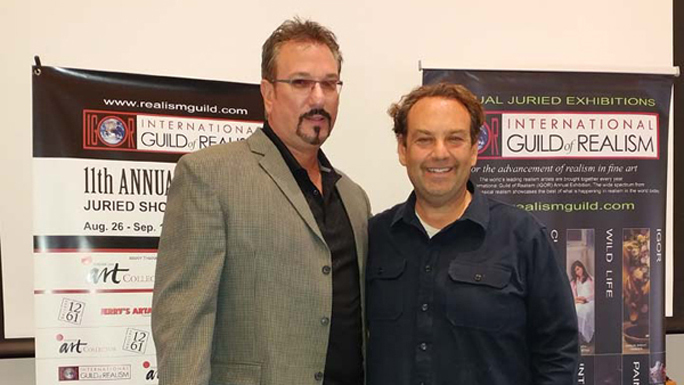 The International Guild of Realism's primary mission is to advance realism in fine art through museum exhibitions, art gallery shows, workshops and education programs conducted by our members, marketing support, and internet exposure. For us, "realism" ranges from the classical based upon traditional, academic-style painting to the contemporary where cutting edge techniques and a wide variety of subject matter are used to comment on today's world. Our members represent a wonderful spectrum of styles including (but not limited to) Trompe l'Oeil, photorealism, surrealism, and super-realism. We know that as greater numbers of art lovers have access to high-quality realism, the value of these paintings will increase  not just in monetary terms, but in appreciation, understanding, and international attention. For art collectors, we have juried exhibitions in museums and galleries that span as many aspects of realism as possible, providing incredible panoramas of international work. For museums, we curate themed exhibitions that capture a snapshot of where realism is today. For fellow artists, we gather and share information about workshops conducted by members, and magazine features about realism techniques. It is our passion and our privilege to continuously grow and share this beautiful art form. We believe the more realism artists succeed in the competitive art arena, the greater the benefit to the art lovers all around the world. Like us on Facebook, follow us on Instagram, check out our YouTube channel, join our email list or feel free to contact us with any questions. Artist, collector, curator or casual fan, we welcome you to our community!